Ro/SS-A and La/SS-B negative in HEp-2 IFA. Can I get positive Ro and La with negative ANA IFA? How to explain if yes? 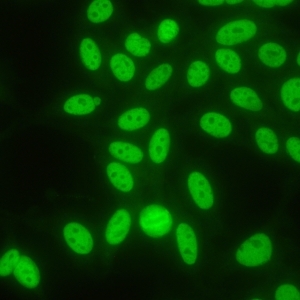 There may be some significant variations in HEp-2 immunofluorescence assay (IFA) staining depending on the manufacturer of HEp-2 cell slides employed. Some autoantigens and epitopes may not be available in some cell preparations. 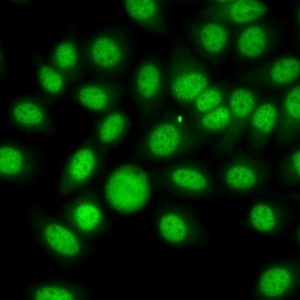 To ensure that the HEp-2 slide in use can detect anti-Ro60/SS-A and anti-La/SS-B staining, appropriate reference materials, such as those from www.AutoAb.org, should be used to verify the HEp-2 slide and other reagents employed in the assay. Experts in the field also advise to have low titer positive controls to test each new batch of HEp-2 slides for appropriate sensitivity. If well-defined standards for anti-Ro60/SSA and anti-La/SS-B do not show nuclear staining, this is a clear indication that the IFA has not been optimized for those autoantigens. The Ro60 autoantigen, in particular, seems to be labile and can be extracted by mild solvents and even prolonged exposure to some buffers. Anti-La/SS-B - in general, high titer positive anti-La/SS-B sera as determined by solid phase assay (SPA) are expected to be positive in HEp-2 IFA. 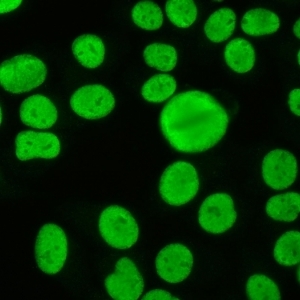 It is unlikely that a high titer anti-La/SS-B serum would be negative in HEp-2 cell staining. A caveat is that monospecific anti-La/SS-B sera are very rare and hence any IFA staining may be related to a second antibody such as anti-Ro60/SS-A. Anti-Ro60/SS-A - there are reports that anti-Ro60/SS-A sera positive by SPA may be negative by HEp-2 IFA. Anti-Ro60/SS-A normally gives AC-4 nuclear speckled staining, but in certain commercially available HEp-2 slides, anti-Ro60/SS-A may be negative. 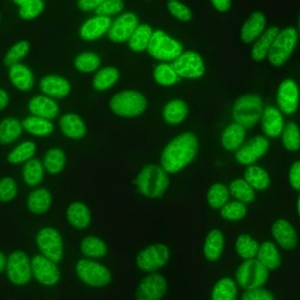 One manufacturer provides HEp-2 cell slides that overexpress the Ro60/SS-A antigen, a substrate that reportedly has higher sensitivity and specificity to detect this antibody than conventional HEp-2 substrates. In contrast, the Ro52 (TRIM21) autoantibody is not regularly recognized in the HEp-2 IFA test. Thus, a monospecific anti-Ro52/TRIM21 serum may have a completely negative HEp-2 IFA.